DETROIT (AP) — John Tortorella hopes his team learned a lesson. 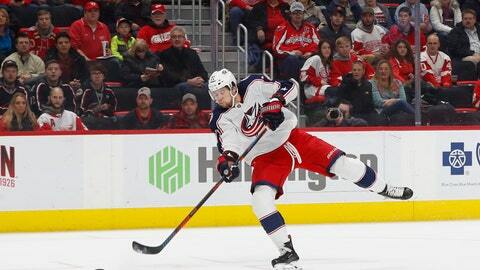 Pierre-Luc Dubois scored two goals to help the Columbus Blue Jackets hold on for a 7-5 win over the Detroit Red Wings on Monday night. The Blue Jackets led 3-0 after the first period and led by four goals early in the second. They started to coast and it almost cost them. After its slow start, Detroit rallied with three straight goals and pulled within one twice in the third period. Dubois’ second goal midway through the third stood after a video review and challenge, giving Columbus a two-goal lead. “It was kind of confusing for everybody,” said Boone Jenner, whose goal gave the Blue Jackets a 5-1 lead in the second. Mantha’s second goal with 2:12 left pulled the Red Wings within a goal again and they pulled goaltender Jonathan Bernier to add an extra skater. Seth Jones took advantage, sealing the victory with an empty-net goal less than a minute later. Sergei Bobrovsky stopped 27 shots for the Blue Jackets, who had lost two of three. “We’re up 3-0 after the first period, but Bob made some really big saves,” Tortorella said. Jimmy Howard gave up three goals on 16 shots in the first period and was replaced by Bernier, who finished with 12 saves. Detroit has lost three straight after winning six of seven. Columbus’ Cam Atkinson’s goal-scoring streak ended at seven games, tying Geoff Sanderson’s franchise record set in 2002. Atkinson was on the ice when Jones scored his empty-net goal. Dubois, Josh Anderson and Artemi Panarin scored in the first period to put Columbus up 3-1. Detroit’s Gustav Nyquist scored in the opening minute of the second, but the home team had any momentum stunted by Markus Nutivaara and Jenner putting the Blue Jackets ahead 5-1 in the second. Mike Green and Dennis Cholowski scored in the second, pulling the Red Wings within two goals. Mantha scored his first of two goals early in the third, giving coach Jeff Blashill another encouraging sign. “He’s really starting to heat up,” Blashill said. NOTES: Tortorella won his 589th NHL game, moving past Nashville coach Peter Laviolette for the most victories in the league by a U.S.-born coach. … The Blue Jackets won the season series 2-1. They opened the season with a 3-2 overtime win at Detroit and lost to the Red Wings last month at home 5-3. … Columbus scratched D Dean Kukan and F Oliver Bjorkstrand. … Detroit D Jonathan Ericsson missed his 11th straight game with a lower-body injury. Columbus: Hosts Minnesota on Thursday. Detroit: Hosts St. Louis on Wednesday.